The Court of the Company of Watermen and Lightermen is the corporate trustee for the Company’s charities – Royal Benevolent and Educational Fund for Watermen and Lightermen (Charity number 1086890) and Company’s Poor’s Fund (Charity number 231320). The principal beneficiaries of Royal Benevolent and Education Fund are Freemen of the Company of Watermen and Lightermen and their widows or widowers. The Charity provides accommodation for retired Freemen (and their widows or widowers) who find themselves in reduced circumstances at Watermen’s Close, Hastings. (See Almshouses page). The Charity also assists with the training and education of its apprentices and other interested parties who are keen to learn the skills associated with the use of inland and estuarial waterways. (See Thames Career page). 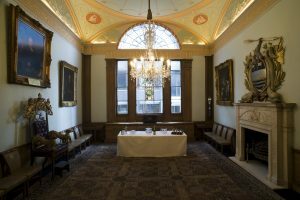 The Charity has an obligation to preserve the building – Watermen’s Hall – and to encourage reasonable public access to view its historic and architectural features, works of art, furniture and artefacts, During the year guided tours of Watermen’s Hall are arranged as well as a participation in the Open House Weekend each September. (See Hall Tours page). Donations are always most welcome as the charities have many calls on their reserves. To make a donation please contact carol@watermenshall.org. It is more tax efficient to make a donation by way of Gift Aid and the relevant forms can be provided on request. All Apprentices, Trainees and Freemen are required to pay Quarterage which supports the Annual Compassionate Allowance. The suggested amount is £52.00 per year(for working Freemen) which can be paid by standing order either monthly/quarterly or annually. If you would like to update your contribution please contact the Assistant Clerk for the relevant forms. There is no shortage of elderly Freemen or their widows eligible to receive the Compassionate Allowance so you can be assured that your donations go to a very good cause. The Trustees of the Watermen’s Company Poors Fund were delighted this year to be able to increase the amount given at Christmas to those on the Compassionate List. This is thanks to the generosity of all those Freemen who pay quarterage. We know how much this means to those who received the annual allowance from the lovely thank you cards received. To apply for the Compassionate Allowance please contact the Assistant Clerk for more information.